Still trying to figure out how to show you the awesome inside. Sigh. In a large bowl, blend Margarine, Brown Sugar, Applesauce, Vanilla and Shortening with a hand held electric mixer until smooth. In another large bowl, mix Flour, Whole Wheat Flour, Cinnamon, All Spice and Ginger with a whisk until blended. Then add Margarine mix to the Flour Mix and blend with an electric mixer until smooth. You want to watch out for any clumps of Margarine. Then add the Baking Soda and blend on a medium speed for a little over 1 minute. Spray your cookie sheet or if you're like us your whoopie pie pan with Baking Spray. Yes. I bought a pan for making whoopie pies. It was $10 and I feel OK about that. 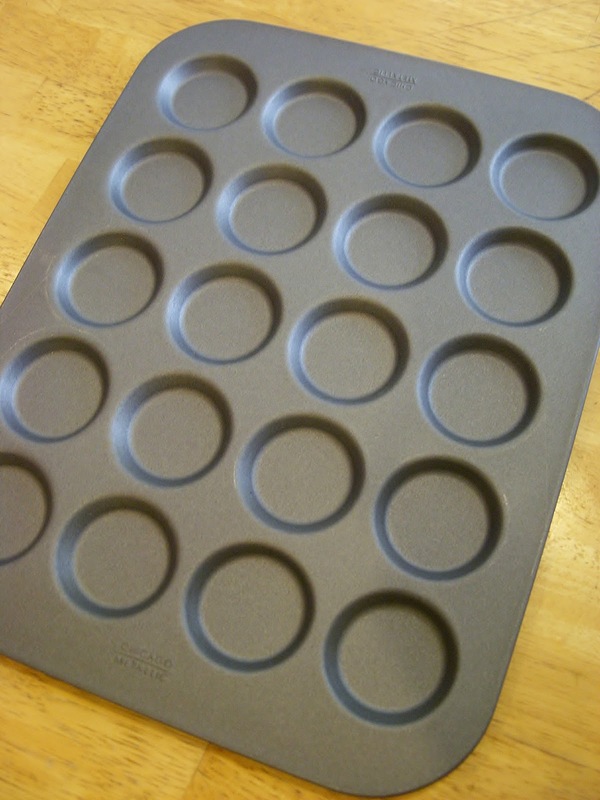 If you're not sure what a whoopie pie pan looks like, it is kinda like a combo of a cookie sheet and cupcake pan with much more shallow cups. Fill your frosting gun or pastry bag with your Apple dough and if you are using a whoopie pie pan gently fill the cups 3/4 of the way. The Dough will expand when it cooks but you want to make sure you're cups are evenly filled. 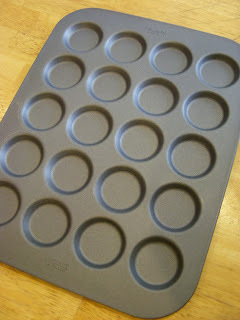 If you are using a cookie sheet, still use the frosting gun or pastry page because it will give you nice smooth edges. Make even "coins" or cookies evenly spaced on your sheet. Don't go too big like monster cookie sized because like I said they get get bigger when you bake them. It's really important to try to keep all your cookies the same size and to have an even amount. Bake for 8 to 10 minutes or until they are golden brown. They are soft cookies so you don't want them too crispy. Let them cool on a wire rack with the bottom side down so you don't mess up the pretty side. While your cookies are baking, make your frosting. In a 2-quart saucepan, melt Margarine over a medium heat. Right at the point where it’s no longer solid (any longer and it’ll just turn into oil, and that’s no good), stir in Brown Sugar and Sea Salt. Heat the mixture to a boil, stirring constantly. Once the Sugar and Salt are melted, stir in the Soy Milk. Let it boil for about 1 minute while stirring constantly. Then remove from heat and let your Caramel sauce cool until it’s lukewarm, which should take about half an hour. After it’s cooled to room temperature, gradually whisk in the Powdered Sugar. It’s important to add it a little at a time, stir it up, and repeat, until it’s all in there in a smooth mixture. If it’s too stiff, you can add in a little extra Soy Milk a few drops at a time or more powdered sugar if you want it thicker. Crush your Peanuts with a masher and spread them out on your cutting board. Once your cookies are room temperature, put your frosting in your frosting gun or pastry bag. 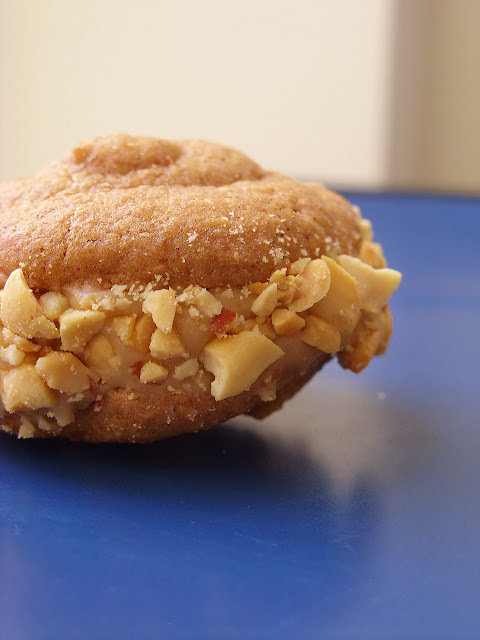 Cover one cookie's underside with frosting and then put another cookie on top. Then gently press the cookies to make the frosting peak out. 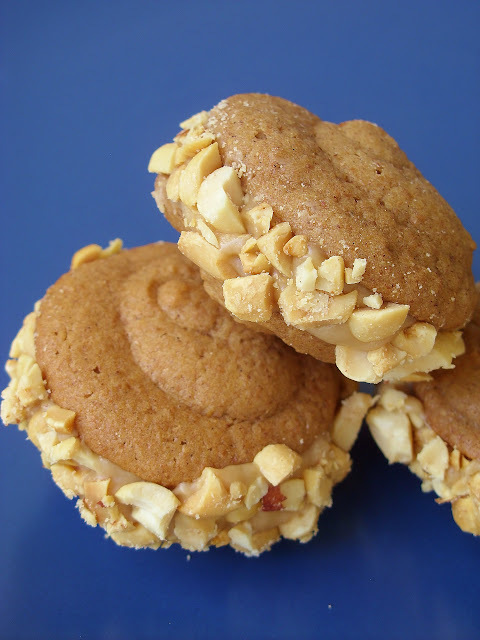 Then roll the cookies in the crushed Peanuts to cover the frosting. You can brush off the salt and peanut dust if you like your treats more polished... but I liked then ones with it on the most. Salt and sugar are a magical combination. I love the little nuts around the edges - so cute! Those look incredible. Thanks for sharing your recipe! 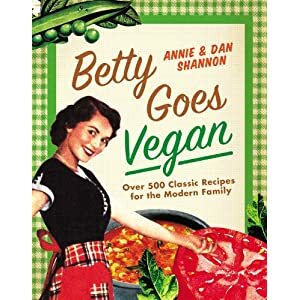 Congratulations on your first day as a cookbook author! A momentous occasion! I am so proud of you for going after your cookbook dream. It isn't easy to give up a career you are comfortable in - and even happy with - to jump with both feet into something so new and even uncertain. I wish you all the best and have no doubt your book will be amazing! I'm going to have to buy a whoopee pie pan thanks to this post!! I can't wait to try your recipe. I may have missed your post about the cookbook, but I AM SO EXCITED THAT YOU'RE DOING A COOKBOOK!!!!! I mean, that NEEDED to happen. How cool that you've got full-time now to work on it! Good luck! And those whoopie pies look ridiculous! Oh man, this take the whoopie pie to a whole new level! Thank you thank you thank you...printing...thank you! I can't wait to try these. Congratulations on taking the leap and working full time on your cookbook. I know it's going to be incredible! Can't wait to see it but also to read about the journey here. Those look absolutely amazing. They are being added to my list of things to possibly deglutenize in the upcoming year. That Chocolove bar is my favorite chocolate bar too! Can't wait for your cookbook to come out . . . Congrats! Oh my goodness, I have to try these! They look delicious. Yay! Congratulations on your happiness. For the last few weeks, I find myself dreading going to work. I wish I had the freedom right now to make a radical change -- today, you are my hero! wowie... congratulations! and those whoopie pies deserve a big whoop! Congrats, Annie!!! So so exciting. Delicious! Salted caramel is the new cool treat. Whoopie! So excited for your book! I have just the spot for it on my cookbook shelf!